This week’s meals were all prepared by Lisa while I was going batty fighting viruses on the computer (hence the lack of recent posts). 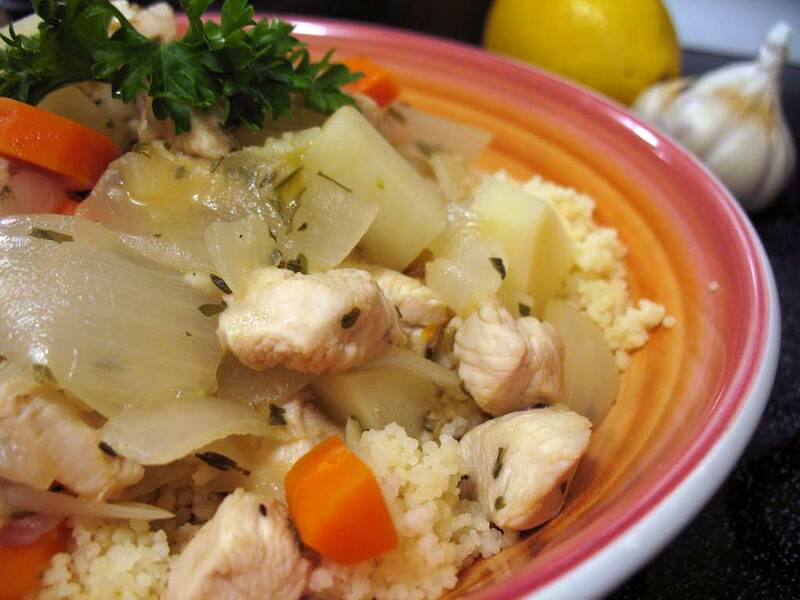 Tuesday night was Chicken Yassa, a lemon-flavored stew with lots of onions and herbs. Lisa prepared this dish over couscous, which soaked up all the juices — it made for great leftovers. The recipe comes from Great Bowls of Fire. Combine the chicken and lemon juice in a mixing bowl. Cover and refrigerate for 30 minutes to one hour. In a large saucepan, heat the oil. Add the onions, garlic, and serranos and cook, stirring, for 5 minutes over medium-high heat. Stir in the chicken and cook, stirring, for 4 minutes. Add the broth, potatoes, carrots, wine, parsley, salt, thyme, and black pepper and bring to a simmer. Cook for 20 minutes over medium heat, stirring occasionally, until the potatoes are tender and the chicken is fully cooked. Meantwhile, combine the boiling water and couscous in a bowl, and cover. Let stand for 10 minutes. Fluff the grains, cover the pot, and let stand until the stew is ready. Spoon the couscous into bowls and ladle the chicken stew over the top. This entry was posted on Tuesday, September 4th, 2007 at 11:30 pm	and is filed under Great Bowls of Fire, Main Dishes. You can follow any responses to this entry through the RSS 2.0 feed. You can leave a response, or trackback from your own site.